While international negotiations to reduce greenhouse gas (GHG) emissions have been less than satisfactory, there is a presumption that a significant level of multi-lateral commitment will be realized at some point. International air and marine travel have been left to one side in past talks because the pursuit of agreement proceeds on the basis of commitment by sovereign nations and the effects of these specific commercial activities are, by their nature, difficult to corral and assign to specific national jurisdictions. However, air travel is increasing and, unless something is done, emissions from this segment of our world economy will form a progressively larger percentage of the total, especially as emissions fall in other activities. This book focuses on fuel. The aim is to provide background in technical and policy terms, from the broadest reliable sources of information available, for the necessary discourse on society's reaction to the evolving aviation emissions profile. It considers what policy has been, why and how commercial air travel is committed to its current liquid fuel, how that fuel can be made without using fossil-source materials, and the barriers to change. It also advances some elements of policy remedies that make sense in providing an environmentally and economically sound way forward in a context that comprehends a more complete vision of sustainability than 'renewable fuels' traditionally have. 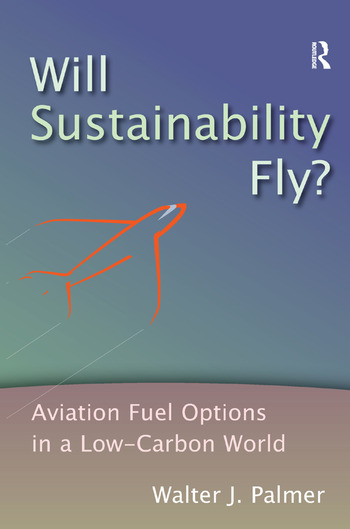 The goal of Will Sustainability Fly? is to broaden and contextualize the knowledge resource available to academics, policy makers, air industry leaders and stakeholders, and interested members of the public. Walter Palmer retired from being an airline pilot in 2008. His career spanned a wide range of flying experience: his first airline posting was to fly aircraft in the high Arctic throughout northern Alaska, Canada's Arctic archipelago and into Greenland; he retired in a senior position flying very large aircraft internationally for a major airline. Walter's time in the industry included major responsibilities within the Canadian airline pilots' professional association in various positions as a technical and safety specialist with particular expertise in air traffic services (ATS). In addition to this he held various offices on the association's executive council. He also undertook a period in airline management as chief pilot at a major pilot base. Walter is a writer and speaker on issues related to climate change and was selected in 2006 to be trained by Al Gore as a Climate Project presenter. As a result of his interest in both aviation and the environment, he has followed developments in the area of sustainable fuels for many years.